I took a break today from my sedentary and completely delightful life of sleeping, reading, watching movies, and blogging to go on a road trip. In CP’s new orange Ford Explorer – transformed into my very own Magic School Bus for the day – we drove up to the end of I-95 and then hopped onto Rt. 1 to venture even farther north. Our destination? Outer space! 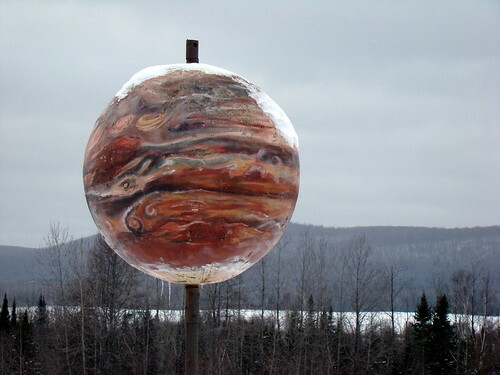 In the Dec. issue of Downeast Magazine we had read about the world’s largest scale model of the solar system. 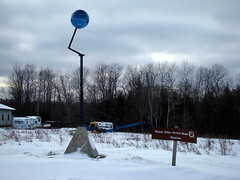 Located on the 40 mile stretch of road between Houlton and Presque Isle, within view for the length of it of the Canadian wilds, and beneath the shadow of the fittingly named Mars Hill, with its futuristic (and strangely gorgeous) ridge lined with windmills…is The Maine Solar System Model. 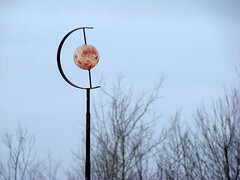 The scale is 1:93,000,000 which converts Pluto to 1 inch in diameter and Jupiter to 61.4 inches in diameter. It was built by the people of Aroostook County in collaboration with the University of Maine at Presque Isle. How cool is that? Jupiter above, with Venus and Neptune below. That is so fun! I love road trips with odd, creative goals. Scavenger hunt style! Ha! I remember the first time I saw Saturn while driving. Last year, a group of us tried to see every planet. We got to them all but Neptune. We were looking on the wrong side of the road! I looked for the planets in the dark on the way up to Fort Kent recently and actually found them all again – except for Jupiter, the biggest and most visible! Haha.